West Kentucky Community & Technical College Chosen as Finalist-with-Distinction by Aspen Institute West Kentucky Community & Technical College (WKCTC) in Paducah, Ky., is a Finalist- with-Distinction for the 2015 Aspen Prize for Community College Excellence. Selected from 1,123 community colleges nationwide, this is the second time WKCTC has been awarded this honor, along with $100,000 in prize funds to sup- port its programs. The college received the prize for achieving outstanding outcomes in learning, degree completion, minority and low-income student success, and employment and earnings. The Aspen Prize, the nation's preeminent recognition of high achievement and perfor- mance in America's community colleges, is awarded every two years. WKCTC has ranked as a Top Ten Finalist every year the Aspen Prize has been awarded since its launch in 2011. Located in a region with low educational achievement and significant industrial decline, WKCTC has worked to draw first-generation students into college and make sure they succeed. Read more at www.aspeninstitute.org/policy-work/college- excellence/2015aspenprize. Innovate Mississippi Awarded Grant to Support R&D and Small-Business Innovation Innovate Mississippi was named one of only 20 organizations awarded the SBA FAST award—a grant that helps support R&D and small-business innovation. This award rep- resents the continuation of funding for the MS-FAST Program, which awards grants and provides expertise to enable more success- ful small-business innovation research (SBIR) and small-business technology transfer (STTR) awards for Mississippi small businesses. Each year, the federal government awards around $2.5 billion through 145,000 SBIR and STTR awards for cutting-edge technologies. The MS-FAST Program has roughly tripled the amount of awarded SBIR funding to Mis- sissippi companies each year since it started in 2001. Innovate Mississippi has partnered with The University of Southern Mississippi since the inception of this program. For more information, visit www.usm.edu/research/ms-fast or email Joe Graben at joseph.graben@usm.edu. Louisville Named a Bloomberg Philanthropy City Louisville, Ky., has been selected to partici- pate in Bloomberg Philanthropies' What Works Cities—a $42-million initiative to help midsized American cities enhance their use of data and evidence to improve the lives of residents. The city will receive expert support and peer-to- peer learning opportunities to make government more effective. What Works Cities collaborates with participating municipalities to review their current use of data and evidence, understand where they are utilizing best practices and identify areas for growth. Through its expert partners, What Works Cities then designs a customized approach to help mayors address a variety of local issues including economic development and job creation, public health and social services. Visit whatworkscities. bloomberg.org for more information. 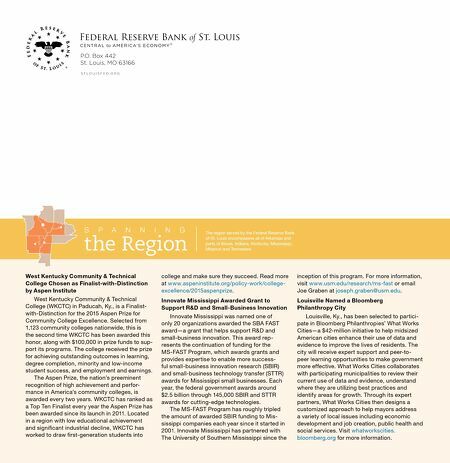 S P A N N I N G the Region The region served by the Federal Reserve Bank of St. Louis encompasses all of Arkansas and parts of Illinois, Indiana, Kentucky, Mississippi, Missouri and Tennessee.